Pictured above is MAY in progress. I did a really cool doodle at art camp in April. Then I scanned it in and printed it on fabric, now I am beading it using some new techniques I got from one of Robin’s books I ordered. Pictured above is APRIL in progress. Experimenting with some different ways to make flowers. I did get to start gardening very early this year. These two months are focused on that idea. Neither is close to being done and I still haven’t really done anything with March. Now it is already time to start June. Luckily, school is almost out and I will have lots of time to catch up on these. 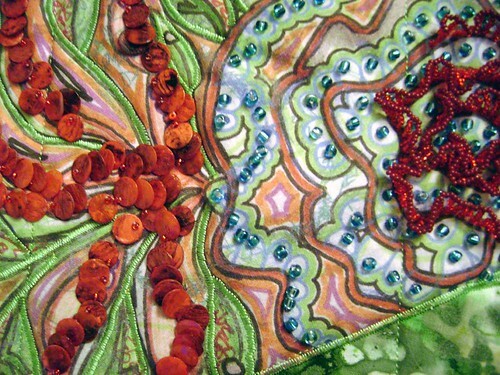 This entry was posted in Bead Journal Project, Fiber Goodness on June 7, 2009 by Sheba. I can’t believe nobody’s commented on these two beautiful pieces yet! Gaaakkk. I’d missed it earlier, so am glad I scrolled down on the BJP blog and found it today. These are fabulous!!!! You are really doing some fun things with the techniques in my book. 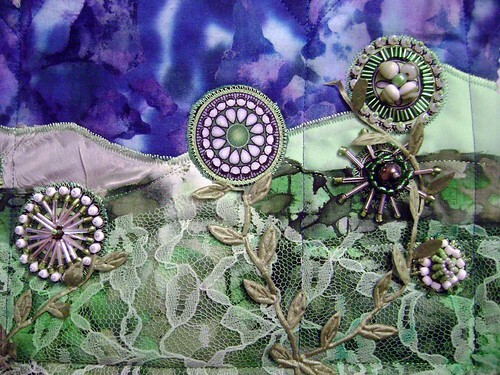 And I LOVE, LOVE, LOVE the way you used your doodle and made it into fabric! Also I love the combination of differen types of needle techniques. Can’t wait to see how they turn out!! !